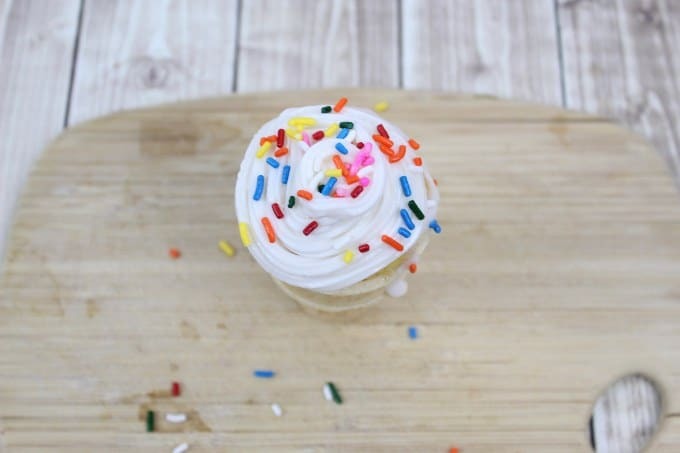 If you want to know how to make Ice Cream Cone Cupcakes, I’ll show you how in this post! 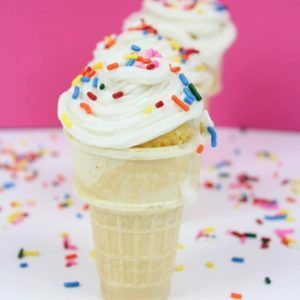 Ice Cream Cone Cupcakes are ones of the easiest desserts you’ll ever make. 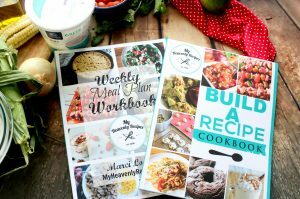 Kids will love making them, too! 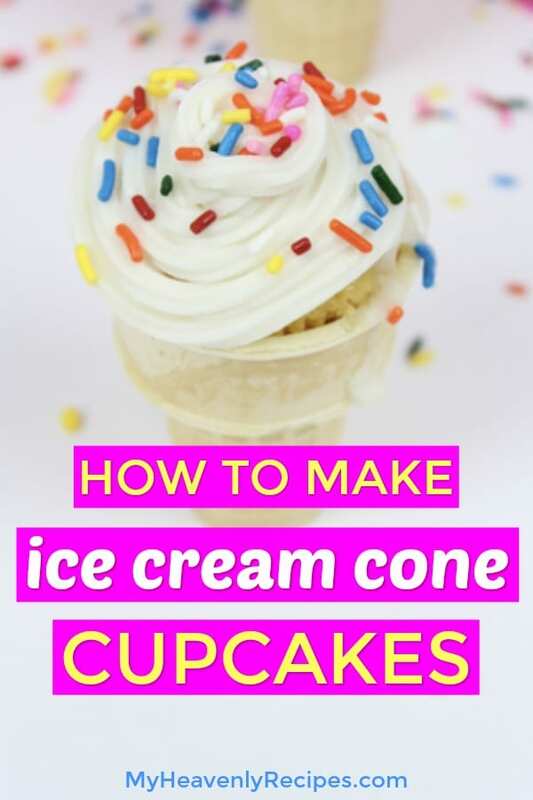 If you’ve found yourself wondering how to make Ice Cream Cone Cupcakes, I’m going to show you exactly how in this post. These cupcakes are just the cutest dessert ever and so easy to make, too! They’re the perfect summer dessert because you get the fun of an ice cream cone without ice cream melting all over the place in the hot summer heat. 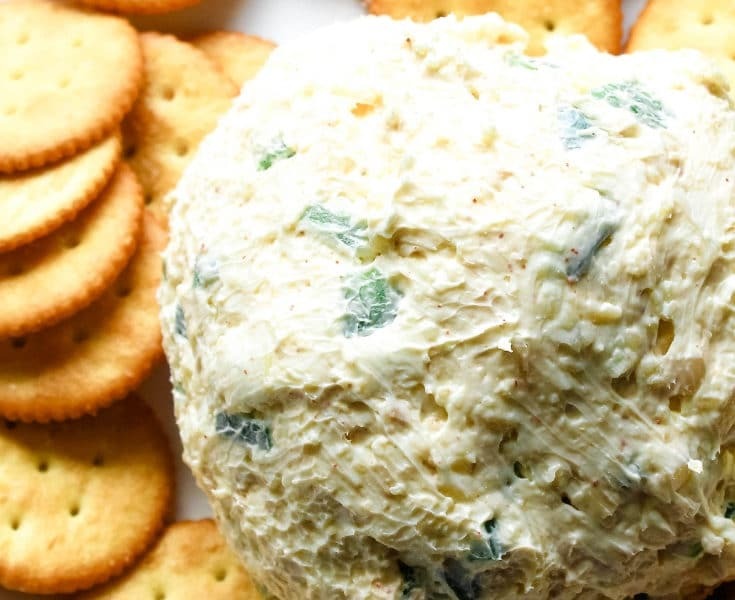 If you don’t serve these for kids (hello, summer birthday party treat! ), kids will LOVE making these, too. Give kids the baked cupcakes, ice cream cones, frosting bags, and sprinkles… and let them go wild. 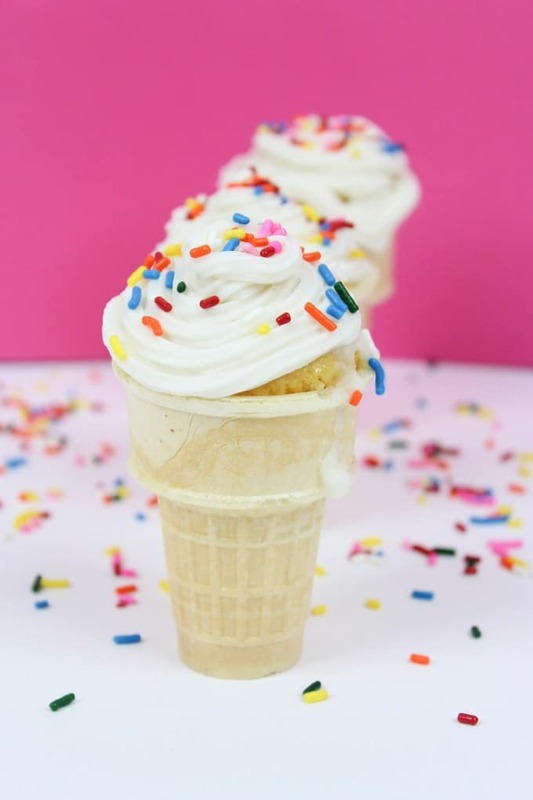 They’ll love making their own perfectly frosted and sprinkled Ice Cream Cone Cupcake! HOW DO YOU MAKE CUPCAKES IN A CONE WITHOUT BEING SOGGY? Fill a cupcake tin, halfway full. Filling it to the traditional 2/3 full will make the cupcakes bottom larger than the opening for the ice cream cone and won’t be able to fit it in without trimming the cupcake to fit. HOW DO YOU MAKE THE CUPCAKES IN THE CONE? I’ve heard from multiple readers that when they make cupcakes in the cone, they become soggy. That is true, that is because the moisture from the cupcake isn’t escaping the cupcake. 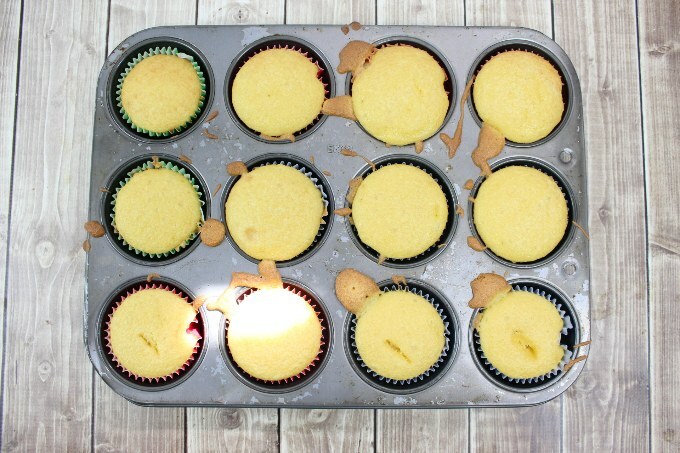 To eliminate soggy cones, remove the baked cupcake cones from the oven, let cool COMPLETELY. You also want to poke a couple small holes in the bottom of the cone to release the steam and moisture. 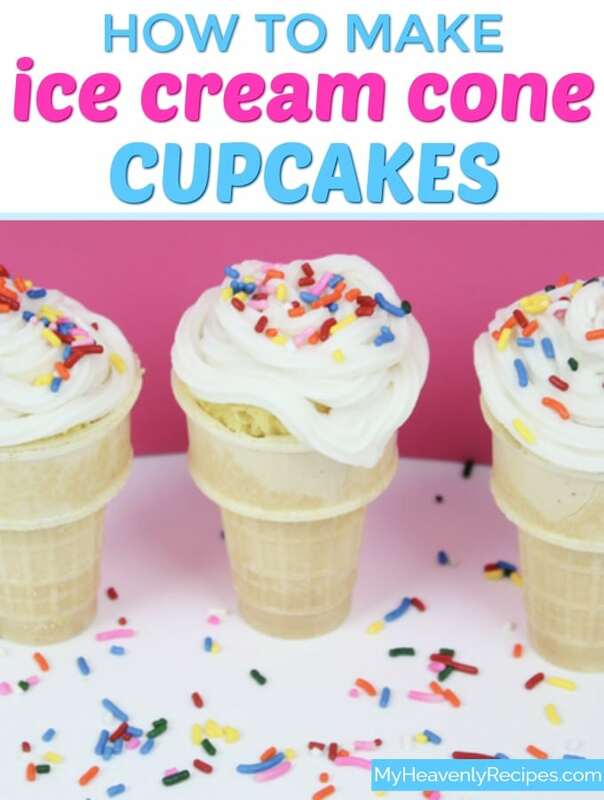 This will ensure that your entire party will enjoy crispy ice cream cone cupcakes! 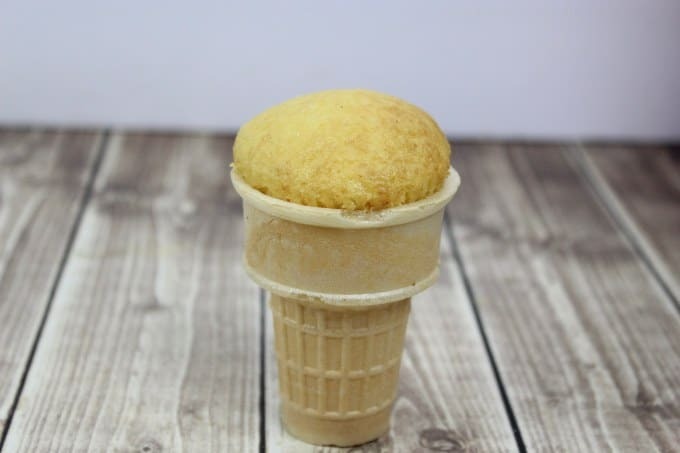 HOW CAN I MAKE CUPCAKES IN THE CONE? Make the cake batter as directed on box. 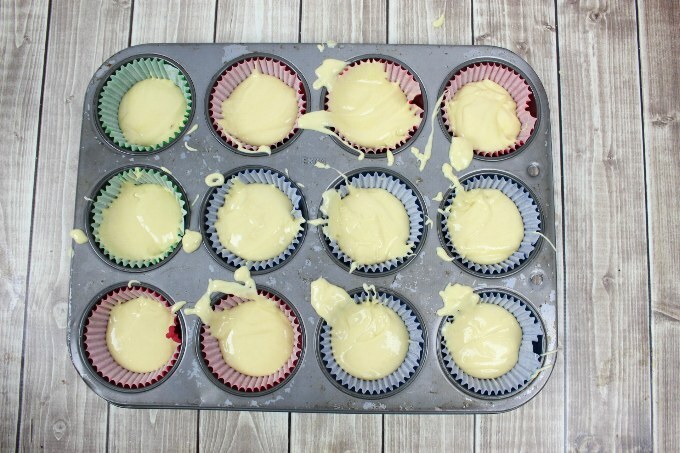 You will then evenly divide the batter among your muffin cups that are filled two-thirds the way full. Next, place the ice cream cone upside down on the batter in each cup. 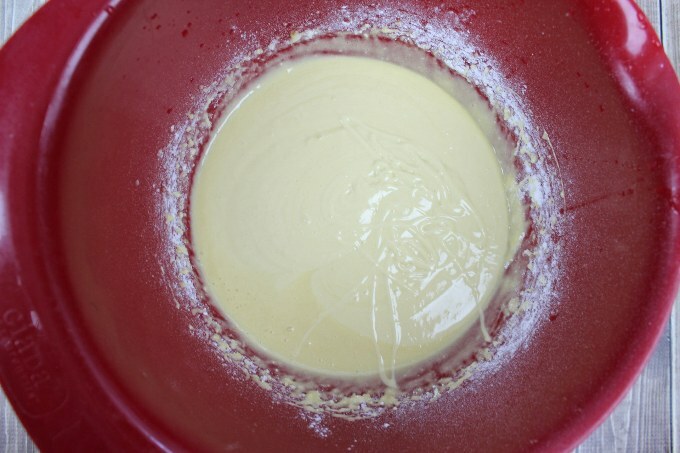 Bake for about 16 to 22 minutes at 325° for dark or non-stick pans or until toothpick inserted in cake comes out clean (cones may tilt on batter). 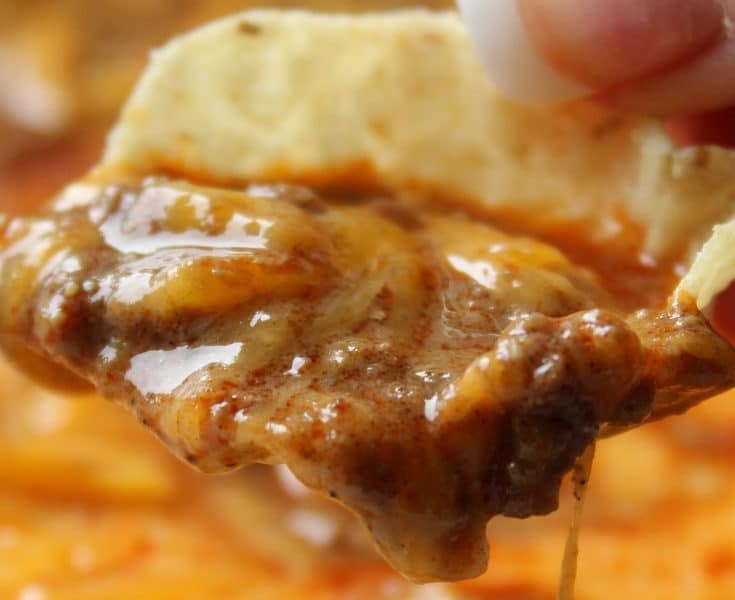 You will want to cool completely, about 30 minutes. Remove paper baking cups. Generously frost cake with frosting, and decorate as desired. Store loosely covered. CAN I MAKE ICE CREAM CONE CUPCAKES DAYS AHEAD OF TIME? In short, the answer is no. However, if you make the cupcakes separately from the ice cream cone, you can totally make them ahead of time. Then the morning of your party you can just set the decorated cupcakes in the ice cream cone. 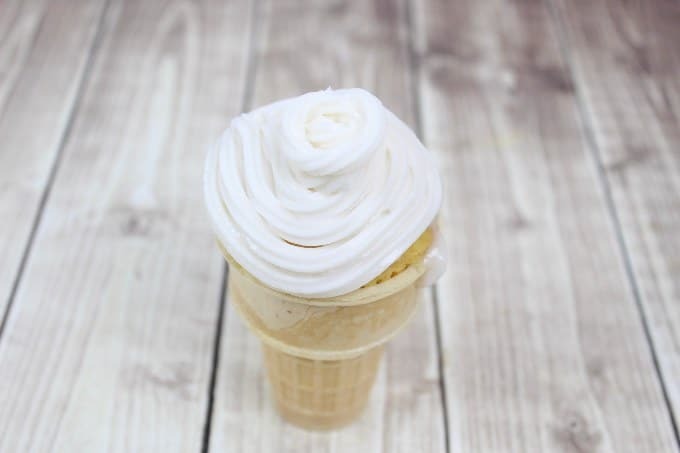 Again, if making more than a few hours ahead of time, you risk the ice cream cone becoming soggy and you’ll want to poke holes in the cupcakes to prevent that from happening to your guests! 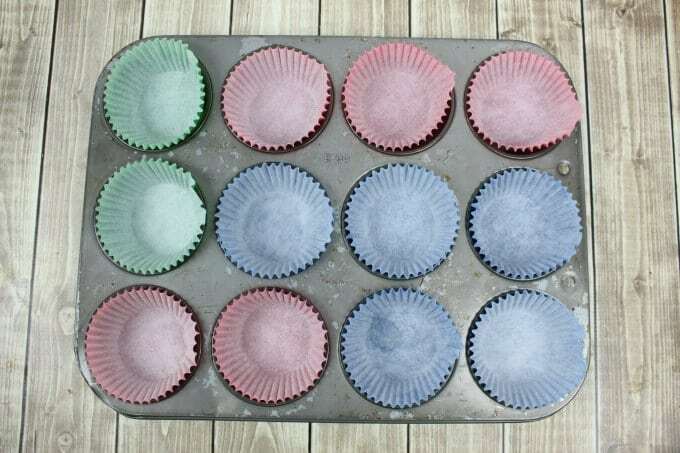 Preheat oven to 350 degrees and line a 12 cup cupcake pan with liners. Prepare the cake mix according to directions. Pour into the cupcake pan, making sure not to fill to the top. Bake for 15 minutes, remove from oven and let cool. Place each cupcake into an ice cream cone. Pipe the white frosting on top to look like vanilla ice cream. 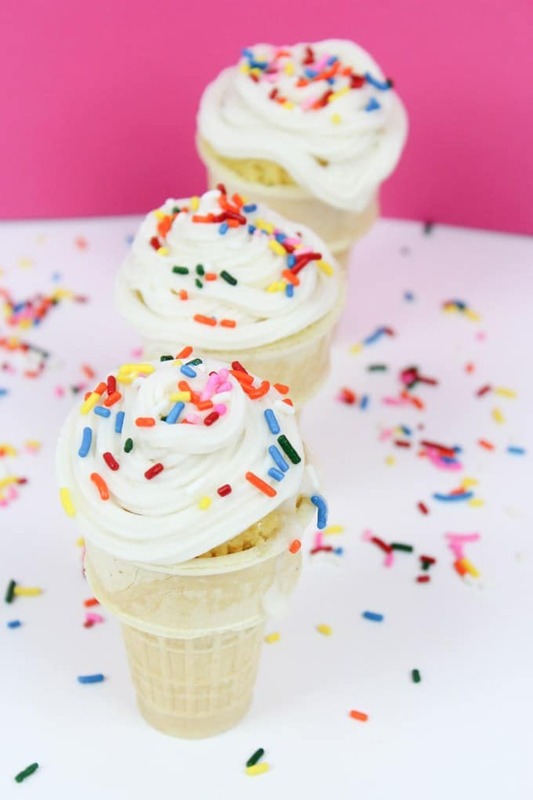 These Ice Cream Cone Cupcakes are super cute and fun to make! Prepare the cake mix according to directions. Pour into the cupcake pan, making sure not to fill to the top. Do you bake the cupcakes in the ice cream cone and how long ice cream cone cupcakes stay fresh? 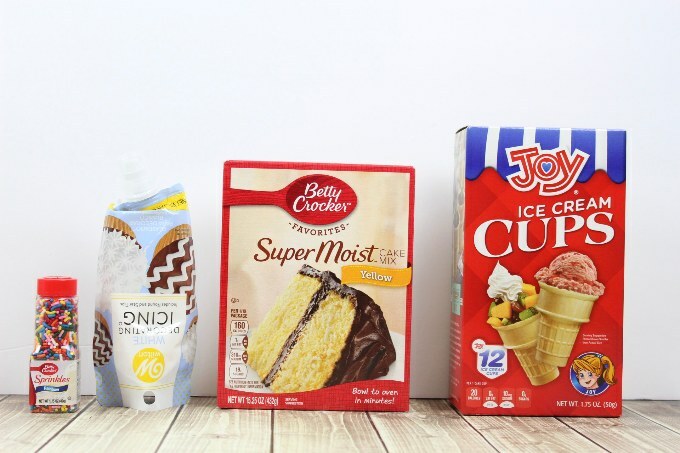 What about using Duncan Hines cake mix? How long ice cream cone cupcakes stay fresh? 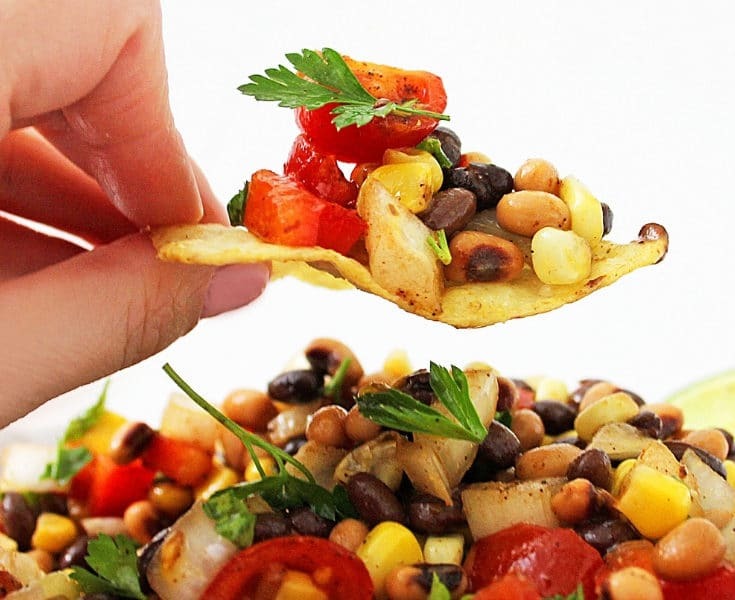 You don’t want to do these but a day before & keep in the refrigerator. Otherwise, the moisture inside the cupcake cone allows them to get super soggy. Sure! You can totally use that! Yes! 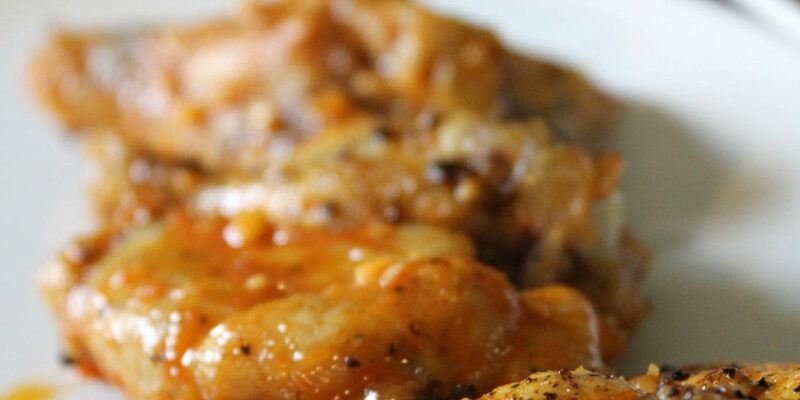 You can’t do this more than a day ahead and you will want to keep them in the fridge. Otherwise, the moisture from the cupcake will cause the ice cream cone to become soggy.